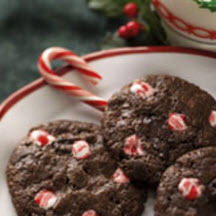 Crushed peppermint candies easily add a festive look and holiday flavor to chocolate cookies. Preheat oven to 350°F (175°C). Line a baking sheet with a silicon baking mat or lightly butter sheet. Combine flour, cocoa powder, baking soda and salt in a medium bowl. Whisk to combine. Combine butter and sugars in a medium bowl, cream together until light and fluffy. Scrape down the sides of bowl, add egg and vanilla; beat to combine. With mixer on low, spoon in dry ingredients; mix to combine. Add crushed candy and chocolate bits; mix until evenly incorporated. Shape dough into 1-inch balls. Place 3 inches apart on baking sheet and flatten slightly. Bake 10 to 12 minutes. Remove sheet from oven and immediately use a metal spatula to neaten any edges where a piece of candy may have melted out. Let cookies cool for about 5 minutes on sheet. *For best chocolate flavor, look for good-quality dark or bittersweet (not unsweetened) chocolate with a minimum of 70% cocoa solids.